As Ebuka gathers the former housemates under the same roof to discuss some of the talking moments of Big Brother Naija See Gobbe. This time, the house was not as full as the first episode, as it only had Soma, Miyonse, TBoss and Uriel, but the room was on fire from start to finish as they discuss topics around the relationships and romance that happened in the house. Soma confessed to coming to the house without a game plan, and coming in to see so many ‘fine girls’ made him consider doing some ‘hit and run’. Again, it turned out that what happened under the duvet didn’t end under the duvet, as Soma brought out the scene involving TBoss and Miyonse under the duvet. 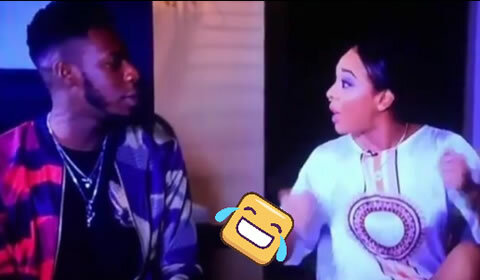 Soma "you guys where hiding under the do me do me"
TBoss - "Am going to slap you"
TBoss- "shut the f**K up"
These are some of the quotes coming from the heated argument between TBoss and Soma. It was again about TBoss as they discussed who she kissed and who she didn’t. Tboss didn’t think twice to confirm that Jon is a “cute guy” and that she didn’t kiss Jon on a “regular say”. Tune in tonight to catch another episode of the BBNaija Reunion Show. The show runs every night at 9:30pm (West African time) from Monday, January 22nd to Saturday, January 27th on DStv channel 198 and GOtv channel 29.